This is Curtis. He is my favorite nephew. And Curtis just turned 9. Being the great aunt that I am, I missed his birthday. Of course, I'm thinking of the best gift to give him in delay and hopefully that will come soon but until then he gets his own post. Late, but at least it's here. 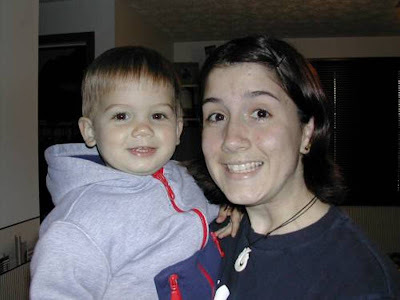 This photo was taken in 2001 when I lived with Curtis when he was just a baby. I taught him a lot of stuff like how to use a head lamp, how to carefully apply chap stick and jump. All stuff you need to learn for getting through the struggles of life. When I see Curtis now I see this little baby but he's not so little anymore. It's the closest I've come to having my own kid and I'm not really sure if I would ever love my own like I love Curtis. Only if I ever have my own kids, I hope I can remember their birthdays. He's adorable. I always say to my mom how if I ever have kids I hope they are as cute and loved as my niece and nephew, so I know exactly how you feel. Miss you. Hope you guys are doing well.